If you live in Hilliard, chances are you are familiar with roundabouts, but are you familiar with the main rules for using them safely? 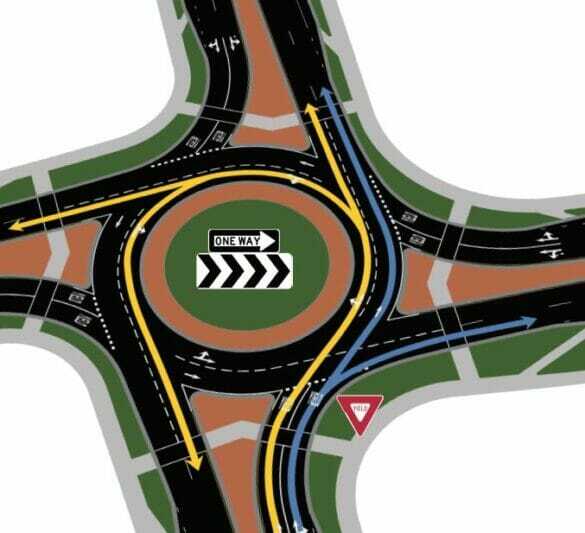 Roundabouts are circular intersections that have been proven to save lives, reduce the severity of traffic accidents, and keep traffic moving. The City has built 14 roundabouts in the past 12 years and wants to ensure residents know the proper way to use them and why they are a preferred choice by City engineers. Roundabouts are a tool to manage high volumes of traffic with less pavement and less delay than at traditional intersections while keeping vehicle speeds down. Since Hilliard’s first roundabout was built 12 years ago, the City has not had a single fatality at one of these intersections. Despite their effectiveness at saving lives, roundabouts can cause some drivers stress due to a lack of information and knowledge about using them. Schamp said that many of the minor accidents that occur in City roundabouts are due to drivers not understanding how to use these intersections. That’s why the City is launching its Roundabout Rules campaign to inform all drivers about the rules of the road and to reduce fender bender crashes. Throughout this campaign, residents will see more educational information from the City on how to properly use roundabouts, including the release of the first-ever roundabout education videos from the state of Ohio. Hilliard had the opportunity to collaborate with Ohio Department of Transportation Highway Safety Program to produce two videos for new roundabout drivers. In addition to education, Hilliard is making safety infrastructure improvements this summer at the Main Street and Cemetery Road roundabout. These improvements include overhead lane directional signs, flashing yield signage in the roundabout’s island, updated road markings and raised crosswalks. For more information on roundabouts, visit hilliardohio.gov.